When Erika Bloom offers to cook, we drop everything and go. The wellness expert and founder of Erika Bloom Pilates knows a thing or two about making delicious, nutritious meals, and like everything she does, executes her recipes in a way that is as fun as it is inspiring. Callum joined Erika’s children to make a family friendly meal featuring fresh vegetables and yummy superfoods. In her own words, she details how to encourage healthy eating in a way that kids will understand and enjoy. Like all of my wellness practices, healthy eating is integrated into my life. I believe that part of why my kids find joy in healthy eating is because they see my passion about finding nourishment from delicious and healing food. My son and daughter take even more pleasure in what we’re eating when they get to help create the menus, prepare and cook our meals. It’s a time for us to connect, share stories, and laugh — and it’s also about making and eating beautiful fresh organic living foods that vitalize us. Whether your family is already eating healthy, or is desiring to establish more conscious habits, here are a few simple ideas for guiding your kids toward healthy choices in the kitchen. I believed my kids were never too young to be exposed to whole, delicious foods. Food awareness from a young age sets them up for a lifetime of making good decisions on their own when the time comes. As parents, we help set up the pattern for the rest of their lives. My kids are aware that healthy delicious foods sustain them. They know their brains and bodies are happier and better functioning as a result. Their moods stay stable because we’re making better choices, and their rewards are not based around food, but feeling good. I feel peace when I open my refrigerator and see a variety of colorful fruits and vegetables. When the kids are hungry for a snack, they know to look in the fridge for cut up veggies and fruit. I know that whatever their choice is, it’s going to be a good one. They see me meditating, using essential oils and eating well. I’m living it — and they naturally desire it. Your values are their values. What happens in our kitchen is a family affair, as well as a sensory experience. They love washing, chopping, touching and tasting the bounty that nature has provided. They set out bowls, which we fill with an array of colorful, fresh vegetables, herbs, and spices. When everything is ready they design their plates. It’s like a painting for them. My kids love picking out our produce at the market or the farm stand. In the summer, they put their hands in the earth and help me tend to the garden. We know where our food comes from, and talk about who else might have helped to bring it to us. All this, before it even enters our mouths. This connection and gratitude for what we’re eating increases our ability to digest and enjoy it. Kids love to feel like they have a say in the decision. Do you want snow peas or English peas? Carrots or broccoli? Parsley or cilantro? When they feel ownership they are more likely to participate. It also saves me from taking multiple dinners and everyone gets what they want. The more exposure kids have to healthy foods, the more likely they are to try them. Always include new healthy options at meal times alongside some of their favorite foods. Sometimes my daughter says she’s not interested in a particular vegetable, but I keep it as an option and she always comes back around to it. Here’s a typical evening in our house, where my kids and I designed the menu. It’s based on our favorite healthy foods and letting them choose their own ingredients. Let the kids choose ingredients to infuse in their water and have them help you cut them up. The kids can fill small water carafes with filtered water and add their own chosen fruit slices, herbs, and spices. Place the infused water in the fridge overnight or even just for 45 minutes while you’re cooking. My daughter Anabella wanted strawberries and mint. My son Alexander preferred oranges and rosemary. Callum chose strawberries. They all made delicious choices and loved drinking them. Have the kids help to chop the cauliflower into tiny pieces after you remove stem and leaves. Let the kids crush the garlic cloves. Dice the shallot. Put the garlic and shallot in a small bowl. Heat 1 tablespoon oil in a large skillet over medium low. Have the kids pour the bowl of shallots and garlic in the pan carefully and then stir until tender, about 6 minutes. Let the kids add the chopped cauliflower and season with salt. Mine love to use the salt grinder! They can then measure out, pour in and stir in the broth (Epic Artisanal is one of my favorites); steam covered until broth has evaporated and cauliflower is tender, about 6 minutes. Transfer to a bowl and keep warm. Let the children choose which combination of vegetables they want in their ‘rice’ and put them in a small bow. Make a pan for each child. In each pan, heat 1/2 tablespoon oil over medium. Add remaining shallot; cook stirring, until tender, about 5 minutes. Add remaining garlic, ginger; cook 1 minute. Let the children pour their veggie bowl in to the pan and stir. Cook until tender, about 5 minutes. Remove from heat. Transfer cauliflower mixture to bowls and add vegetable mixture. Let the kids season with salt and then mix in their favorite toppings of herbs, spices, and seeds. My daughter loves cumin. My son loves garam masala. I use raw organic seeds. Lately my son and I have been adding radishes to finish as well. They’re delicious, as well as prebiotic. When I was young, my family spent summers in Mexico and we always drank ‘banana milkshakes’ which was just very ripe bananas in the blender. If you freeze the bananas in glass first, the Vitamix turns it into ice cream – then you don’t waste ripe fruit. Then we sometimes used coconut milk or goat milk, but now with my kids, we use almond milk (other non-dairy milk options work great too, depending on allergies and preference). Let the children place the frozen bananas in the Vitamix and blend until texture of ice cream. You can eat it just like this or add a splash of almond milk. You can also make gelato by using frozen berries with no milk. The kids choose a mix of blackberries, blueberries. My favorite is cherries. Making your own almond milk is easy but an extra step. When purchasing almond milk, look for brands that don’t use gums, sugar and other additives. I personally love the unsweetened versions of New Barns organic almond milk. I make these as a treat or to add in to the Banana ‘Ice Cream’ for variety. Melt the chocolate. Let the kids stir until smooth (they love this)! Let each child have their own small glass pan. Have them pour a thin layer of chocolate in. Everyone gets to choose their additional ingredients. 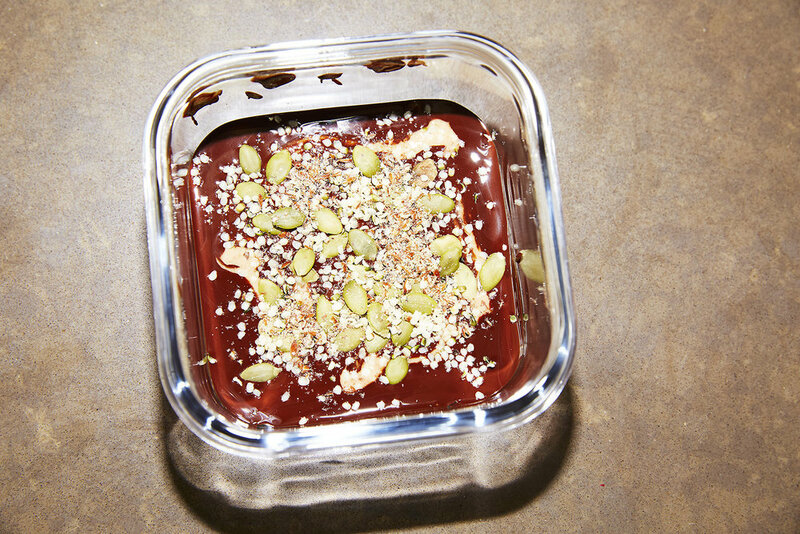 Add a layer of seeds followed by a layer of almond butter, followed by another layer of toppings. Add a final layer of chocolate. Place in freezer until hardened and keep chilled until you’re ready to serve. We break up the cacao bark and put it on top of the ice cream. I love Bonajuto 100 percent cacao bars for my version of the Healthy Candy Bar. For the kids I use 75-80 percent chocolate. I find that the natural sweetness of almonds makes the chocolate bark taste sweet even though there’s little to no added sugar. When purchasing nut butters, look for pure ground butters with no extra oils or sugar. MaraNatha Organic Raw Almond Butter is one that I love. Thank you Wild Dove, for documenting an evening of meal time at our house. I love watching the smiles on my kids faces from the time we start making the meal to the time their tummies are filled and calm. I can rest easy at the end of a long day, knowing that I’m nourishing them and myself with beautiful food, and we all get to enjoy the process.